NASA has picked the final landing site for its next Red Planet rover after years of debate and will unveil its choice on Friday (July 22) — nearly 35 years to the day after the space agency's storied Viking 1 probe touched down on Mars, agency officials said. Out of more than 30 sites considered as possible landing targets for NASA's Mars Science Laboratory mission, by November 2008 four of the most intriguing places on Mars rose to the final round of the site-selection process. The announcement will be held at the Smithsonian's National Air and Space Museum in Washington on Mars Day (July 22), which comes just two days after the 35th anniversary of NASA's Viking 1 Mars landing on July 20, 1976. The rover is so large that instead of using only thrusters for a controlled landing like the recent Mars Phoenix Lander, or giant airbags to cushion a bouncy touchdown like the rovers Spirit and Opportunity, Curiosity will land with something new — a rocket-powered sky crane. 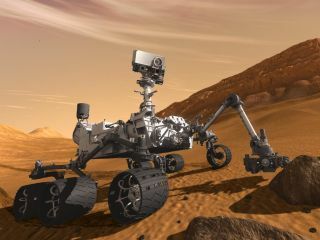 NASA will broadcast the Friday press briefing to announce the Mars rover's landing site live on NASA TV, as well as via a webcast, which is available here: http://www.nasa.gov/ntv.